God's Work Is Waiting on YOU! God's work is seriously in need of more qualified ministers! Hundreds are being brought yearly into the truth — scattered brethren need to be visited, comforted, anointed when they're sick. Perhaps YOU have not recognized your own responsibility to your brethren! "LIFT up your eyes, and look on the fields; for they are white already to harvest" (John 4:35). In the month of January, 1958, mail from listeners almost DOUBLED that of January, 1957! God's work is LEAPING AHEAD in power and scope as never before! Everywhere, people are beginning to RECOGNIZE THE TRUTH, and turn to God in repentance as a result of this work! Even MINISTERS are writing in, requesting The PLAIN TRUTH and the Correspondence Course — from which they are teaching their congregations. Many letters have been received from all over the United States, from the Philippines, from Hawaii and other areas, written from whole GROUPS of people who are meeting together — crying out for a MINISTER, a TEACHER, to come and help them! We need to recognize the desire of human beings to fellowship with others. Frequently, we receive letters asking, "Where can I meet with brethren of LIKE FAITH?" When people begin to see the truth — they immediately begin looking for a PLACE TO MEET — for OTHER PEOPLE who are ALSO in the truth. The primary commission to the Church is to preach the Gospel of the Kingdom of God — the Good News of the World Tomorrow to this whole world as a witness! But the secondary commission is also vitally important! That commission of FEEDING THE FLOCK IS being performed as well as we are presently able to perform it — BUT WE MAY BE FALLING FAR SHORT OF WHAT WE SHOULD BE ABLE TO ACCOMPLISH! Most people can hear the broadcast at least once daily. All can receive The PLAIN TRUTH and the Good News magazines, in addition to the other booklets. All can take the Bible Correspondence Course, which is a full-time study almost in itself. These are all media by which the Church can "feed" the flock! BUT IT IS NOT ENOUGH! For those who are stronger in the faith — perhaps attendance at the Festivals and the study helps already mentioned, in addition to their own diligent BIBLE STUDY and PRAYER, are sufficient to keep them secure in the faith of Christ, and safe from the wiles of Satan. But for the "babes" in Christ, who are just BEGINNING to learn of new truth — and who, even though they are really hungering and thirsting for knowledge, are still UNAWARE of the many pitfalls Satan will set for them, IT IS NOT ENOUGH! For example, word came recently that about FORTY persons, who had come to learn of the true SABBATH day through the radio broadcast, joined Adventist Churches in a western city! Think of it! As mere BEGINNERS in the faith, sincerely seeking truth, they were led by THEIR DESIRE FOR FELLOWSHIP to "join" a denomination of this world, following the fallacies of a self-styled "prophetess" whose own writings demonstrate that she twisted and wrested God's Word. How many times this may happen when we DO NOT hear word of it we have no way of knowing. This is our responsibility. God works through human instruments. He is saving and including in HIS KINGDOM those whom we can be responsible for guiding in the RIGHT PATHS. Many will not be in the first resurrection because WE ARE NOT REAPING THE HARVEST GOD IS SUPPLYING! You probably already KNOW that God lays it on every child of His to "PRAY YE therefore the Lord of the harvest, that He would send forth labourers into His harvest" (Luke 10:2). Are you really DILIGENT in your prayers? I want to dispel and quench once and for all a false assumption many of you have had. Many have believed there is only ONE WAY for a layman to qualify for the ministry at this time. That is to come to Ambassador College — as a regular student — and, if qualified upon graduation and perhaps four full years here, be ordained into the ministry. There is not one single scripture in the entire Bible that says any such thing! We have received APPLICATIONS to enter College from men who have been successful in BUSINESS — men with homes, a family, furniture, a good job, who want to UPROOT themselves — sell most of their earthly goods, and come with their families and personal possessions to Pasadena so they can enter college! They aspire to HELP in the WORK. And because they have falsely ASSUMED the ONLY way to "help in the work" is to somehow GET OUT TO PASADENA, they foolishly decide to leave their successful business, and subject themselves to financial disaster, after which they no longer even have tithes to support the work. NEVER have those of us in the ministry said you MUST go to Ambassador College before you can be ordained! NOWHERE in the BIBLE can even the barest PRINCIPLE be construed as to say such a thing! It may be God is calling you for a specific duty to perform NOW! "But I'll NEVER LEARN TO PREACH," some begin to reason, "if I can't get to Ambassador College to take the speech courses and the Bible courses!" And therein lies the big MISTAKE many have been making! Let's see what it is! GOD calls His ministry, and in every case He calls them for a specific FUNCTION! The OFFICES, or the RANKS within the ministry only denote the particular KIND of SERVICE the man has been chosen, of GOD, to perform! And so Peter and Paul were ordained as APOSTLES! It is NOT a "high and exalted" office to simply DECORATE and ADORN the man! But notice the FUNCTION of an Apostle! They were the spiritual LEADERS of the Church under Christ, who is its HEAD! Christ had directly trained the original disciples (Matthias had been among the 120 from the beginning, and was selected to take the place of Judas Iscariot) and revealed THEY were to be the very beginning, the FOUNDATION of the Church. Paul was inspired of God to write, "And [you] are built upon the foundation of the APOSTLES and prophets, Jesus Christ Himself being the chief cornerstone" (Eph. 2:20). We know the Apostles were always PREACHERS! Peter PREACHED to the people on the Day of Pentecost in A.D. 31, and his sermon is recorded in Acts 2. Other public messages of Peter are recorded in Acts as well. Paul was a preacher. He said, "... I have PREACHED to you the Gospel of God ..." (II Cor. 11:7). He told Timothy that he had been "APPOINTED a PREACHER, and an APOSTLE, and a teacher of the Gentiles" (II Tim. 1:11). In the first letter to Timothy, Paul had said, "Whereunto I am ORDAINED A PREACHER, and an apostle" (I Tim. 2:7). There are many statements about Paul's preaching recorded in his own writings, as well as those recorded by Luke in the book of Acts. Notice, however, that in every case those who were PREACHERS had either a SPECIAL GIFT (and remember, God gives Spiritual Gifts according to our natural several abilities) for public speaking, or else they had a good deal of TRAINING to do so! Peter was filled with the Holy Spirit, and, after having been with Christ almost day and night for 3 1/2 years, was amply qualified to PREACH! PAUL had been brought up at the feet of Gamaliel, one of the greatest Rabbinical teachers of that day (Acts 22:3). Paul had been studying for years towards becoming a Rabbi. Could it have been this mark of distinction that caused the Jews in the many synagogues to ASK Paul to SPEAK to them whenever he walked in? In ADDITION to his wide background — having associated with some of the LEADING ORATORS of his period, Paul got personal, individual TRAINING, first from CHRIST HIMSELF (Gal. 1:12 and 16-18 with I Cor. 9:1 and 15:8) and later, after conversion, he was "... with them [the Apostles] coming in and going out at Jerusalem" (Acts 9:28). Paul's ordination, together with the circumstances surrounding it, was thoroughly explained in a previous article on "How God Calls His Ministers." It is also a part of God's plan to place men who are gifted in public speaking in the office of EVANGELIST. "And He [God] gave 4:11). These men, after being TAUGHT and INSTRUCTED in the Way of God, went about PREACHING to believers as well as unbelievers. Philip and Stephen were both among the original seven Deacons chosen in Jerusalem. Yet BOTH of them, because of their natural gifts AS WELL AS their strong MOTIVATION and SPIRITUAL ZEAL, qualified for the office of EVANGELIST! Stephen's career as an inspired speaker of God's Word was cut short by his murder at the hands of the Jews. But Philip went to Samaria, where he "preached Christ unto them" (Acts 8:5), and is distinctly named as an EVANGELIST later — even though he had originally been appointed as a Deacon (Acts 21:8). Later, the Apostle Paul began to take young men with him to TRAIN in the ministry. We find Paul traveling with a "company" of men (Acts 13:13; 21:8) during his various journeys in God's work. The Apostle Paul had real ZEAL in wanting to accomplish the work God had given him to do. He tirelessly, through much tribulation and many trials from enemies, preached the Gospel all over the northern Mediterranean regions. "... I strived to preach the Gospel ..." he said to the Romans (Rom. 15:20). He told the Corinthians that Christ had SENT him to "preach the Gospel!" (I Cor. 1:17). In this he "laboured more abundantly than they all" (I Cor. 15:10). Paul felt the real MISSION of preaching the truth of God. "Yea, woe is me, if I preach NOT the Gospel!" he said to the Church at Corinth (I Cor. 9:16). But Paul did not do all the PREACHING BY HIMSELF! The first part of Paul's plan was his own personal evangelism to proclaim the Gospel of the Kingdom of God! The SECOND part of the plan was vitally important, too! When Paul and Silas went through the area of southern Galatia, to the cities of Lystra and Derbe, he found a certain disciple, named Timothy. After training under Paul, Timothy became an Evangelist! (II Tim. 4:5). Timothy was able to PREACH! "I charge thee before God," said Paul to Timothy, "PREACH THE WORD; be instant in season, out of season; reprove, rebuke, exhort with all long suffering and doctrine" (II Tim. 4:1-2). But Timothy was not the ONLY young man to be called into the work of God as an Evangelist! Titus, who was a Greek, was an Evangelist in charge of the Churches on Crete, a Greek colony. God always works in this manner. Now notice an amazing pattern evident in Paul's work! In Acts the 20th chapter, we see Paul has been in Ephesus, where the great uproar was caused by the pagan worshipers of Diana of the Ephesians. Then, Paul went to Macedonia to the Churches already established in Philippi and Thessalonica — and then into Greece proper (Acts 20:1-2). He stayed there about three months, and decided to return to Asia (to the Churches of Asia, principally the large congregation at Ephesus). But, instead of taking the immediate sea route from Greece, he decided to return THROUGH Macedonia. And so we see Paul in Greece (probably at Corinth) starting to swing NORTH, through Macedonia, and so down into Asia from Philippi. "And there ACCOMPANIED him into Asia SOPATER OF BEREA; and of the THESSALONIANS, ARISTARCHUS and SECUNDUS; and GAIUS OF DERBE, and TIMOTHEUS; and of ASIA, TYCHICUS and TROPHIMUS" (Acts 20:4). Here were men from BEREA, where Paul had raised up a Church (Acts 17:12), from THESSALONICA, where a Church was established (Acts 17:4), from DERBE, where a local congregation also existed (Acts 14:6,7 & 23), and from Asia, where all SEVEN Churches John addressed in Revelation were located! Do you see the importance of this? TIMOTHY was an EVANGELIST! He was taken WITH Paul in his travels for a time of TRAINING — being PERSONALLY with Paul almost day and night for YEARS on his perilous journeys! And TIMOTHY is mentioned FIFTH in this line-up of men WHOM PAUL HAD WITH HIM during these important trips to the Churches! Why did Paul have so many men from various local Church areas WITH him? What did they do? Let's see! Sopater was a man of Berea. Some believe he may be the same as the Sosipater named in Romans 16:21, but whether this is true or not, he was at least a Christian who was intimately associated with Paul in his travels. Aristarchus and Gaius are called "men of Macedonia [they came from Thessalonica], Paul's companions in travel" (Acts 19:29), and are specifically mentioned as having come to EPHESUS — across the sea, on a different CONTINENT — with Paul. Aristarchus was with Paul later in ROME, and was called a fellow prisoner of Paul at the time of the writing of Colossians (Col. 4:10). Secundus, also from Thessalonica, is mentioned but once, as traveling with Paul toward Asia. Gaius, who came from Derbe, is mentioned as being with Paul in Corinth at the writing of the book of Romans (Rom. 16:23). Timothy was from Asia — as has already been mentioned - and was Paul's closest and most dependable helper (Phil. 2:19-20). Tychicus and Trophimus are both mentioned several times in Paul's Epistles. Tychicus was used as a messenger to deliver the Epistles of Colossians (Col. 4:7 and 8) and of Ephesians (Eph. 6:21-22) from Rome, and may have been the scribe who wrote the letters at Paul's dictation. And so the SECOND part of Paul's plan is clearly evident. He took with him certain QUALIFIED MEN for personal, intimate, individual TRAINING in the ministry. These men undoubtedly had Spiritual gifts added according to their natural abilities, as is evident in Timothy's case — and Paul could use them in a vitally important part of the work of God. Notice! These men would go FROM PAUL to the LOCAL CHURCHES, sometimes delivering letters, and exhorting, establishing and STRENGTHENING the Churches. For example, Trophimus is pictured as being at Miletum, afflicted with sickness, just after Paul's second apprehension and imprisonment at Rome (II Tim. 4:20). Miletum is a small city about 50 miles south of Ephesus. Trophimus was from ASIA. Paul had previously been two whole years at Ephesus, at the school of Tyranus, teaching (Acts 19:9-10). And yet, a good distance SOUTH of Ephesus, here is Trophimus ill. What was he doing there? He was an EPHESIAN (Acts 21:29)! Undoubtedly, he was traveling about in that area of Asia, working with the brethren, when taken sick. Paul had to leave him behind prior to being apprehended and thrown into prison again in Rome. THESE YOUNG MEN EVIDENTLY WERE EVANGELISTS! There are many more who are mentioned, such as Apollos, who was a naturally gifted speaker, called an ELOQUENT man" (Acts 18:24). But Apollos was also "MIGHTY IN THE SCRIPTURES!" Everywhere, you see these men PREACHING the word of God, delivering Epistles, strengthening the brethren, establishing Churches (I Thes. 3:2), ordaining Elders (I Tim. 3:1-7 with Titus l:5), doing the work of EVANGELISM! God used Paul to supply MOST of the details concerning Church government. Jesus Christ showed the AUTHORITY given His ministers in "binding and loosing," but it remained for God to inspire Paul to reveal the various offices and their functions in carrying out God's work. Already, we see Paul was carrying on extensive personal evangelism. Also, he was following Christ's example of training young men as future ministers by giving them PERSONAL, intensive experience in the ministry, then ordaining them and sending them out. But the third part of Paul's pattern of work is also vitally important! Paul and Barnabas were chased out of Iconium, and fled to Lystra and Derbe (Acts 14:1-6). At Lystra the people had to be prevented from worshipping the two Apostles as a result of a miraculous healing. After going to Derbe, they immediately returned to the area from which they were driven out — FOR VERY IMPORTANT PURPOSE! "They returned again to Lystra, and to Iconium, and Antioch, confirming the souls of the disciples, and exhorting them to CONTINUE in the faith, and that we must through MUCH TRIBULATION enter into the Kingdom of God. And when they had ORDAINED THEM ELDERS IN EVERY CHURCH, and had PRAYED WITH FASTING, they commended them to the Lord, on whom they believed" (Acts 14:21-23). This was just prior to the Jerusalem conference. Paul had to leave the area of southern Galatia for a time — and it was not good to leave without first establishing GOVERNMENT in the Church — ordaining able men as ELDERS to watch over the flocks. Paul DID NOT impulsively ordain men who had not been TRIED and TESTED! He wrote to Timothy that he MUST NOT lay hands on a "novice" or one newly come to the faith! (I Tim. 3:6; 5:22). Don't forget that MANY Jews, who had been given qualities of LEADERSHIP, had been converted LONG BEFORE, in Jerusalem (see Acts 2). There were Jewish men from Asia, Phrygia and Pamphylia, all areas where Paul was very active in raising up churches. Undoubtedly there were many converted Christians in these areas even before Paul arrived. In this way, God had sown the seeds of His Church even YEARS BEFORE. Since it was NEVER permissible to ordain a man who had not been AMPLY QUALIFIED, who had not been SOUND in the faith — TRIED AND TESTED — we know Paul could not have ordained Elders within only a few weeks after their conversion. Acts the 17th chapter gives the account of Paul's preaching at Thessalonica. It was here that Aristarchus and Secundus were probably converted. Again, it is very likely that some had been converted about 19 years EARLIER, and had been living as Christians since that time. Paul reasoned with the Jews and many of the Greeks THREE SABBATH DAYS (Acts 17:2), and as a result "some of THEM" — some of the Jews — "believed, and consorted with Paul and Silas: and of the devout Greeks a GREAT MULTITUDE" (Verse 4). Paul left by night, going to Berea, then to Athens and later to Corinth. Only a VERY FEW MONTHS had passed when Paul wrote to the Church that had been raised up at Thessalonica, the first of his letters to be included in Scripture. He had sent Timothy back to Thessalonica FROM ATHENS (I Thes. 3:2) — Timothy the EVANGELIST and already an ordained minister of God — to "ESTABLISH" this Church! IN THE LETTER ITSELF Paul gives commands that are to be carried out by some who were in AUTHORITY. In closing the letter, Paul said, "And we beseech you brethren, to KNOW THEM which labour AMONG YOU [not Paul, and others who were FAR AWAY most of the time — but those among the Thessalonians — who were RIGHT THERE] and are OVER YOU IN THE LORD [a Spiritual office], and admonish you; and to esteem them very highly in love FOR THEIR WORK'S SAKE!" (I Thes. 5:12-13). Those who were addressed more particularly in the letter were given charge that the Epistle be read to all the holy BRETHREN" (I Thes. 5:27). How plain! Here must have been local ELDERS — either ordained by Paul or by Timothy, who was sent back to Thessalonica to establish the Church — Elders who could utilize the instructions from God's Apostle and Evangelists in exhorting the flock, praying for the sick, comforting the weak, explaining and expounding the intent of the Scriptures. THIS was the vital THIRD PART of Paul's plan! He COULD NOT have trusted just "anyone" to take over these newly begotten "babes" in Christ! He needed thoroughly consecrated spiritual ELDERS to place as overseers of the flock. Paul, a few years later, called a brief ministerial meeting at Miletus, south of Ephesus, when he was on his way to Jerusalem for the Day of Pentecost, in the Spring of 56 A.D. Paul was later captured, left in prison at Caesarea for two years, and then taken to Rome in the FALL of 58 A.D. Apparently, his haste in wanting to be in Jerusalem prohibited a short overland journey from Miletus to Ephesus, so he called the ELDERS of the Ephesus area to him. THESE MEN WERE TRAINED UNDER PAUL'S PERSONAL DIRECTION DURING HIS THREE-YEAR STAY in the region of Ephesus (Acts 20:31). They had been ordained as Elders in God's Church. They had qualified. God had revealed through Paul the iron-clad regulations that must be adhered to in choosing Spiritual leaders of the flock. But notice what Paul predicted of them! "Take heed therefore unto yourselves," he said, after reminding them of his past efforts in diligently preaching the Gospel, "and to all the flock, over which the Holy Spirit hath made you OVERSEERS, to FEED the Church of God, which He hath purchased with His own blood. FOR I KNOW THIS," admitted Paul, "that after my departing shall GRIEVOUS WOLVES enter in among you, NOT SPARING THE FLOCK. "Also of YOUR OWN SELVES SHALL MEN ARISE [SOME OF THESE VERY ORDAINED ELDERS], speaking perverse things, to draw away disciples after them" (Acts 20:28-30). Many years later, Christ's message to the Ephesus Church through John was this: "Remember therefore from whence thou art FALLEN" (Rev. 2:5). Yes, Paul knew even as he ordained some, that they might yield to human vanity and greed, and ultimately turn sour. Mr. Armstrong has also had some similar experiences. Years ago, he realized the need of ordaining ELDERS, in some instances, to help oversee the flocks that were being gathered together in Oregon. According to the needs of the work — according to all the evidences in the lives of the men concerned, the "fruits" of their sincerity and faithfulness — Mr. Armstrong was led, like Paul, to ordain Elders! Later, when tests came, some of these very men turned their backs on God's work — and became more interested in their own selfish pursuits! Some God struck down — others were scattered, until today none remain faithful. MISTAKES WERE MADE! BUT WHO MADE THE MISTAKES? PAUL, FOR ORDAINING ELDERS AS GOD HAD COMMANDED? — MR. ARMSTRONG, FOR ORDAINING ELDERS AS GOD DIRECTED? OR THE ONES WHO HAD BEEN ORDAINED, AND GIVEN THE SERIOUS RESPONSIBILITY OF OVERSEEING GOD'S OWN CHOSEN PEOPLE, AND WHO THEN TURNED AWAY FROM GOD? Once Elders were ordained, the responsibility was THEIRS! NO HUMAN BEING CAN FORESEE THE END FROM THE BEGINNING! Even GOD does not foreordain WHETHER or not YOU will "turn sour!" Yes, mistakes were made — not by God's Apostles — but by those unfaithful ones who TURNED AWAY, following their own lusts and selfish interests! God's Church is growing by leaps and bounds! But it is seriously lacking the qualified ELDERS it needs to ably care for the flock! Many of the ministers are "spread out" over an area hundreds of miles across, so to speak, and, as so many of you brethren well know, are literally having to "live behind the wheel of a car" to minister to the needs of the flock of God. It is GOD'S INTENTION that some QUALIFY as local ELDERS to help share this tremendous LOAD! If this pattern were followed, the college trained, ordained ministers who have had PERSONAL, INDIVIDUAL training from Mr. Armstrong, and who have been gifted to PREACH, could much more effectively minister to the needs of the people — being assisted by able ELDERS who could labor among the brethren in their own local area. Instead of driving 50 or 100 miles at night to anoint a sick person — the sick one could call his own LOCAL ELDER who would live close by. Did you ever read a single scripture in the Bible that tells us we must have a preaching service every Sabbath? Can you find ONE SINGLE SCRIPTURE laying down rules for having a HYMN, then a SERMON from one who is qualified to PREACH? And yet — because many of the brethren have not seen their own responsibility — some have begun to ASSUME they are EXCLUDED from being a direct help in TEACHING the flock, because they're not qualified to PREACH! God's ministers have never said we must have a PREACHING SERVICE each Sabbath! Some of the smaller Churches are still conducted as BIBLE STUDIES, as Question-and-Answer sessions, instead of a regular "Church Service." It is vital for your Christian growth that you hear PREACHING! Make no mistake about that! But it is not possible for MOST of the Church to hear personal preaching each Sabbath! Because God's Church is mostly a SCATTERED Church, many must study privately, following the lessons of the "Correspondence Course," and listening to the broadcast. Let's look into the actual QUALIFICATIONS for ELDERS, and see the astounding truth! God reveals it is a GOOD THING for a man to earnestly desire to be of SERVICE in His Church. "This is a true saying, If a man desire the office of a bishop [Elder], he desireth a good WORK. "A bishop [Elder] then must be BLAMELESS, the husband of one wife, vigilant, sober, of good behaviour, given to hospitality, APT [ABLE] TO TEACH; not given to wine, no striker [or quarrelsome person], not greedy of filthy lucre, but patient, not a brawler, not covetous, one that RULETH WELL his own house, having his children in subjection with all gravity" (I Tim. 3:1-4). Amazing though it may seem to you — THERE IS NOT ONE SINGLE SCRIPTURAL QUALIFICATION IN THE ENTIRE BIBLE THAT SAYS AN ELDER MUST PREACH! He must be ABLE TO TEACH the scriptures — able to TEACH others how to live a godly and Christian life — able to HELP others by being hospitable, being patient with their problems, being willing to anoint and pray for the sick — but he is not obligated to PREACH! NOWHERE, in all the examples of Church gatherings, of qualifications set down in scripture for Elders, is there the slightest indication that Elders had to stand and PREACH each Sabbath — or that they ever did! Rather, the APOSTLES and EVANGELISTS did the inspired SPEAKING! The Elders were ordained as spiritual overseers of the flock. They were to "take care" of the Church of God! Many of you men who probably COULD HAVE BEEN QUALIFYING have not been doing so — because you were laboring under the false assumption that you could never be used in God's work unless you first spent a full four years at Ambassador College! This is not necessarily so at all! Now READ THE OTHER QUALIFICATIONS for Elders, in the remaining two verses (6 and 7) of I Timothy 3 and in Titus the 1st chapter! An Elder must HOLD FAST the faithful word — and be able by SOUND DOCTRINE to exhort and convict the gainsayers! He must be able to STAND AS A REPRESENTATIVE OF CHRIST — to GIVE AN ANSWER FOR THE HOPE THAT IS IN HIM — to explain and expound thoroughly the basic doctrines, the meaning of prophecy and the times in which we live, the great PLAN of God and what it means! He must be a man of FAITH — able to PRAY in absolute ASSURANCE for the sick, anointing them with oil and KNOWING they will be healed! He must be an UNSELFISH man! His time will totally belong to God! He will be willing to ADDICT himself to the ministry — laboring night and day among the saints — GIVING of himself in humility and patience that others can receive help. Decide an "Elder" is a pretty "high" office — and one that will get you a lot of "respect." Let everyone KNOW of your intentions to "get" this office for yourself! Be outspoken and vociferous — express "your opinions" loudly every change you get. Jump in and be quick to answer a matter with your mouth so you can display "leadership." Have all the answers — never be willing to say, "I don't know!" Don't receive correction — let everyone know how self-justified and righteous you are. Display your superior "spirituality" by a lot of spiritual-sounding words. Always "talk it up" BIG — impress people! This is the EXACT OPPOSITE WAY FROM THE BIBLE! And yet, it is the HUMAN way! MEN tend to believe it is OTHER MEN they must impress and please! If you begin to try to impress Mr. Armstrong, or your local Pastor, you are starting down the sure and quick road to a box canyon of uselessness! There is no quicker way to insure YOU'LL NEVER QUALIFY than to begin to EXALT YOURSELF. GOD will select and ordain, through His apostles and evangelists, the Elders when they are qualified to serve in that capacity. Do your qualifying on your knees! Do your work toward becoming of service to your brethren by HUMBLING yourself. Be willing to be the LEAST of men. ABASE the self — DEFLATE the ego — GIVE your life to Christ! Don't be the least bit concerned about whether or not anyone "notices" you — and your deeds! Do whatever you do heartily, as UNTO THE LORD, and not as before men! God works through His human instruments in His Church. He will reveal to THEM the need — and the individuals who will fill that need. Brethren, this is a great NECESSITY for God's work! It is a SHAME on the true Church of God for this time that we have NOT ONE SINGLE LOCAL ELDER IN THE HEADQUARTERS CHURCH! MANY CHURCHES DO NOT EVEN HAVE A DEACON! WHAT ARE SOME OF YOU GOING TO DO ABOUT IT? Can you be STIRRED TO ACTION? Are you going to begin to ABASE yourselves — studying with renewed ZEAL so you KNOW the truth of God and can EXPLAIN it to others? May God help some — who have the potential, to WAKE UP TO THE CALL OF CHRIST — THE HEAD OF THIS CHURCH — so that the work of God is not HINDERED any more! 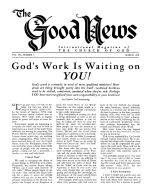 STUDY that article on "How God Calls His Ministers" from the September, 1957 "Good News." If you need a copy, we still have some extras left. And PRAY about it. PRAY that God will WAKE UP some who are drowsy, sleepy — spiritually lethargic! God's work waits on YOU!